Genuine leather wallets laser engraved. Laser Engraved Wallets are engraved using a laser. The result is that the image can appear darker at first but will lighten as the image wears. high quality wallet with built in RFID BLOCKING. High quality wallet with built in RFID BLOCKING. This is all skilfully crafted in smooth Nappa leather and it looks and feels great. Personalisation should be limited to initials only as space is at a premium. The lost includes a Sergeant slip on, Cadet Warrant Officer slip on, large Corporal stripes, an older version Warrant Officer slip-on and a 1950s/60s period Chief/Junior Technician badge. This latter badge was worn both in the RAF and by cadet forces after a new rank structure was introduced in the early 1950s. A pair of recent issue RAF Officer Cadet gorgets / collar tabs. This has included white cap bands, armbands, shoulder tabs and latterly collar tabs (known as gorgets). These have been used since the late 1940s and in recent years have also included braid of various colours to denote the trade or the flight/Squadron the trainee is with. 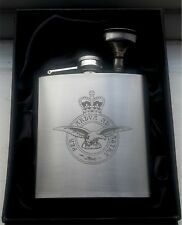 Royal Air Force 6oz Stainless Steel Hip Flask Laser Engraved with Royal Air Force Crest, complete with funnel in satin lined black presentation box. IDEAL PRESENTATION GIFT. BRITISH ARMY AIR CORPS APACHE PILOTS CHEST WING. A Unused & New Condition Royal Air Force Queens Crown Full Sized Flying Officers Cap Badge. To traditional outdoor layering systems. Wind resistant and Water repellent. Wind repellant. For 15 Years Long Service & Good Conduct. Royal Air Force. Complete With The Correct Original Ribbon And A Swivel Suspension Fitting. Lanyard Width 3/4" (2cm). Heavy Duty Safety Buckle. Add to Favourites. ROYAL AIR FORCE CAP & BADGE (57-ZB). A Very Good Condition Royal Air Force Cap and Badge. A Royal Air ForceCap & Badge. So Look the Biz. Also ' Mach Loop LFA7 ' horizonal sticker as picture. Jets are 4 x Tornado (various configs) plus a F15, F16, F35, F22, Typhoon & a Hawk. The Machynlleth loop. These photos are to illustrate the decals applied to my car. The crest of the RAF Dental Branch. The image is printed on both sides of the mug. RAF Stripe Tie. Made from high grade Polyester. Dry Cleaning Only. Embroidered Patch. made with love by. Add to Favourites. 90mm x 110mm Approx'. Embroidered Patch. made with love by. Add to Favourites. 9cm x 11cm Approx'. RAF British Army JERSEY. V NECK BLUE GREY. SIZE 4. SMALL / MEDIUM.. EXCELENT . RAF JERSEY JUMPER. V NECK BLUE GREY. ALMOST NEW. Shown as Remploy 1986. RAF Royal Air Force ID Bronze/Tan Desert Combat Jacket/Shirt Name Tape Genuine! Sew On RAF 'Royal Air Force' ID DesertCombat Jacket/Shirt. Royal Air Force. Ideal For All Serious Collectors Of The Royal Air Force. - 100% Genuine! The Royal Air Force Cufflinks. 22mm round cufflinks. Would alter to fit a smaller waist as buckle can be moved along belt, as well as belt being fully adjustable anyway. Great condition, but buckle has mini scratch marks. I photographed the length from end to end but you need to leave an overlap to pull through. 'Spirit Of Great Britain Vulcan Alongside the Red Arrows'. If you were lucky enough to see and hear one it's an experience you will never forget. I've tried to capture this in a drawing and the prints of which that are on sale here are mounted. The RAF Air Cadets (RAAC) Cufflinks. 20mm round cufflinks. The perfect gift for a loved one or to spoil yourself. Royal Air Force Wall Plaque. Picture Hook Fixing on Rear of Plaque. Specification Size Hand Made in UK For The MOD.